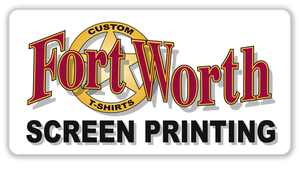 We are at your service here at Fort Worth Screen Printing! Here are the considerations and information requirements necessary to get the ball rolling on your order. 1. What Image Do You Want To Have Screen Printed On Your Promotional Items. We are specialists in custom tee shirt and promotional products design. We have a full time art department to take your design ideas and create great artwork for your custom orders. If you already have artwork please see the Artwork section of this site to learn how to get your art to us and see the requirements for customer supplied artwork. ​2. What Do You Want To Print On? Our Goods Or Yours? ​Some promotional product distributors prefer to provide goods to us for printing, while others prefer that we provide the entire turnkey product. Either way is fine with us! 3. What Determines Final Printing Price? Excluding the goods, here are the basic elements that determine how much your finished products will cost. At FWSP we offer many other services including personalization, number application, embroidery brokering, folding, bagging, split shipments, 3rd party billing and special labelling. All deliveries are FOB our Factory, Ft. Worth Texas. Net 30 terms are extended with prior credit approval. Payment is COD without approved credit. No orders will be accepted, produced or shipped for any customer with delinquent invoices. *All prices and terms are subject to change without notice. Get your promotional screen printing order started today!